Here is the meta breakdown for Gushfest (officially known as the April MTGO Power 9 Challenge). Data as usual was collected by Matt and me. As the events title implies, a huge portion, 45.8%, of the meta was gush decks. Moreover, all but 2 of the decks we classified as gush were mentor decks (there was 1 doomsday deck that we classified as combo). There were only 4 dredge and 4 shops decks in this event, although they did post a reasonable 50% and 55% winrate respectively. Note that many of these archetype vs. archetype percentages are based on a small number of matches, especially those not involving a gush deck. The severe drop in oath's winrate can likely be attributable to the huge drop in the number of shops pilots. See http://themanadrain.com/topic/82/mtgo-march-2016-power-9-challenge/2 to see the degree to which oath preyed on shops last month. Likewise, the winrate of combo can be attributed to this same drop in shops. Although the metagame is quite imbalanced, I would hope that the impressive performances of dredge and shops against gush will entice more people back to those archetypes in the future. Likewise, the impressive winrate of combo can be attributed to this same drop in shops. 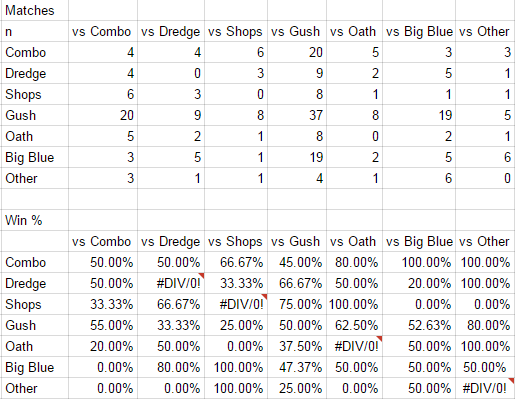 A funny quirk of the small data set is that Combo actually took 4 of the 6 matches against Shops. Gush was actually the statistical "best" deck against Combo at 11-9. That's pretty amusing; I didn't even look at that before I wrote it up. Even though as you mentioned the number of matchups is small, I think there's something to be said about how much the restriction of lodestone improved that matchup for combo, since they just need to resolve 1 hurkyl and now have much more time to do so. Additionally, the more aggressive Eldrazi Shops lists cheat on spheres. Also, I am pleased that Ryan kept the name "Oreo Oath" in there to describe the 2 Griselbrand, 1 Iona Oath deck. @diophan Awesome write up! Couldnt play in this event today, but good to see the #s from the (GUSH)meta. Great job as always Matt and Ryan! Congrats to Rich on winning the event. 9th place really leaves a salty taste in my mouth and I'm already looking forward to the next one. And I think Gush will be a 1x come Eternal Weekend. Great write-up. Thank you for putting this together. This is valuable for the entire community. And wow, that sure is a lot of Gush. Awesome work on this, and congrats to Rich. I kinda had a feeling it was Rich's day - especially when I knew I couldn't play all day ). It's a goal of mine to win one of these in the not too distant future. I enrolled, but had to drop with a 2-1 record after the third round (but before the fourth round started) when my GF summoned me to the beach with 80 degree weather in SF today. That's a hazard of both living in California and playing tournaments online. My loss in the second round due to being clocked out because I was on the phone with my partner discussing the details of our day for the better part of the match. That said, I did lose to a game 2 Levitation on the crucial turn. That was sick. I'm disappointed that the turnout was so low, but I'm going to more proactively advertise the next one, and maybe that can make a difference. Turn out seemed to be higher when tournament announcements for these were posted, etc. Do you guys have a breakdown for the P9 event immediately following the September B&R? Glad we have 2 B&R announcements between now and champs, one more for another unneeded restriction and then the last hope for a correction only to be savagely disappointed. The largest paper event this weekend (LCV) was 6 of 8 Gush decks. Don't think Sam Black played in either. Unless I'm overlooking something there seems as though there are parallels that can be drawn between the two in regards to meta representation immediately following restriction. I guess we'll see how things flesh out going forward. @Smmenen Rich and I were wondering why the 2-1 drop. Hard to compete with a beach day! I think the low turnout was a combination of multiple GP's and PPTQ's this weekend. More advertising certainly wouldn't hurt though. It could also maybe just be a bunch of people who only owned shops cards (and not things like FoW or blue power) and didn't want to bother. Or maybe people who quit when the deck they really liked was neutered. Probably a bunch of factors. That final was really one of the best played, most exciting games of magic I've ever seen played. I think you are pretty spot on. The 100+ EE3 tournament right after the September announcement had <10% Shops as many of the Shops regulars didn't make the trip. The field also supposedly had a decent amount of Storm, Belcher, and TFK decks, but I don't think any of them made the top 8, and I slogged through a bunch of Gush mirrors and Landstill decks at the top tables. The problem is, I don't really see a reemergence of Shops leading to diversification of Blue...the last time it happened, people switched to Delver and Dredge on Magic Online and the format remained pretty miserable in my opinion. Combo had a good run this time, but historically has not done well against Gush despite the prevailing opinion that it beats it.